Guestbook - email us your memories and photos. May 5, 2013 - Ian Stephen - England - I used to spend a lot of time with The Hoochie Coochie Men and got to know Rod and L.J.B quite well. My memories are a bit sparse due to the stuff we were on...but I do remember we were all devastated by Cyril's death - and me and Rod were aspiring to be gob-iron players. 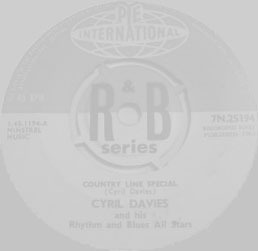 I think we were both strongly influenced by Cyril's style and Sonny-Boy Williamson, who we both met at a gig in Windsor, must have been '64. Rod went on to play with LJB on harp; I was more Sonny Terry style as a solo artist - guitar, vocal and strap. I can remember Cyril being a quiet man and cool but that's about it I'm afraid. Good luck with the biog, perhaps you could let me know when it's out. Oh! and I'm still blowin' up in the North-east and have a YouTube channel for some of my songs. Good luck!